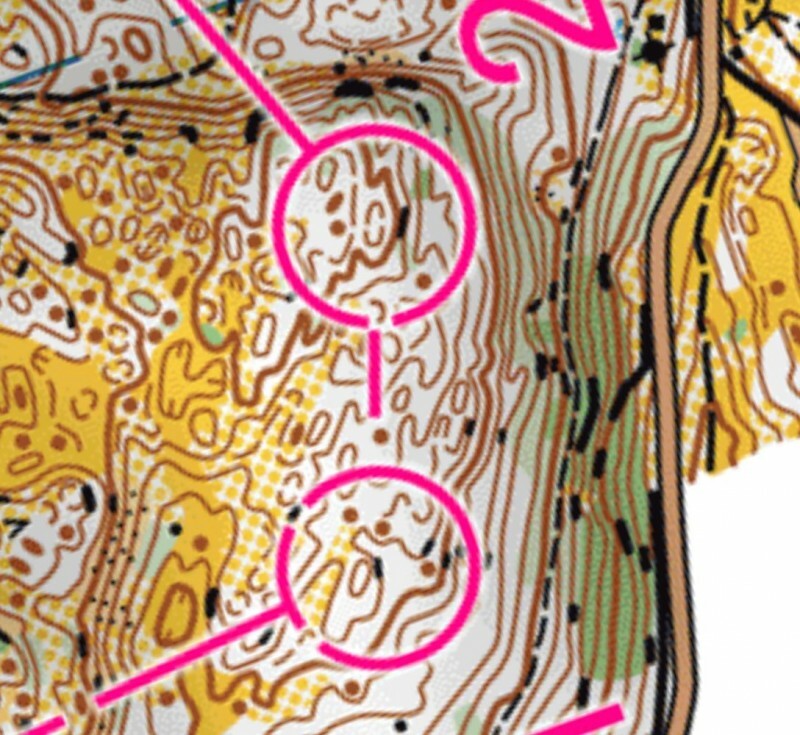 The women’s class in the Junior World Championships (JWOC) Long distance 2016 featured decisive routechoice legs, big mistakes by top runners and drama. Below we take a look at the race from start to finish and take a look at all the decision points in the race. Anna Haataja (Finland) won 1:50 minutes ahead of Valerie Aebischer (Switzerland) with Sofie Bachmann (Switzerland) in 3rd at 2:54. As the following analysis will show, Haataja won the race due to having the most stable race – loosing 43 seconds or less to the leg winner on all legs (least of all runners) and only winning 2 of 17 legs. Haataja did not have a perfect technical race though, her accumulated time loss to the best split time being more than 4 minutes. Even if Haataja’s winning margin was nearly two minutes, the battle for victory was close; Valerie Aebischer (lost 2:09 at leg 6 shown above due to a bad routechoice, finished 1:50 behind in 2nd) and Simona Aebersold (lost 8:45 at leg 8 due to first forgetting the control, finished 8:30 behind in 12th) were both only one control away from beating Anna Haataja. Read on for a full analysis of the race. Looking at the timeloss distribution per leg compared to the fastest split time among the top three, you see clearly how Aebischer has a good race start compared to Haataja’s mediocre start, while Haataja on the other hand has a strong finish. Tilda Johansson took the lead at the first control, but after a nearly 2 minute mistake at the second control, Valerie Aebischer took over the lead – running a very good race until the 5th control. The route choice to control 6 cost Aebischer the lead – here the Sprint winner Simona Aebersold took over the lead and soon extended the leade to 1 minute. However, the 8th control was cruicial for Aebersold – the Swiss lost 8:45 due to forgetting the control. The race winner Anna Haataja then took over the lead, and kept it until the finish. 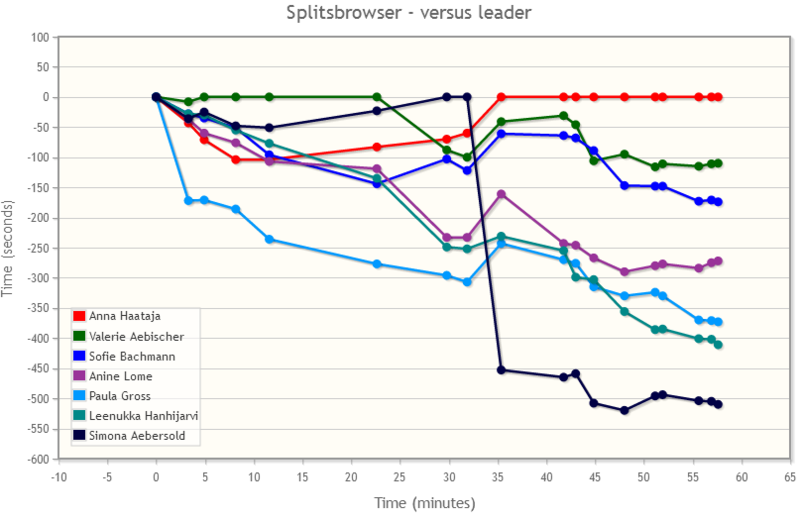 The below split time graph shows how the race developed. 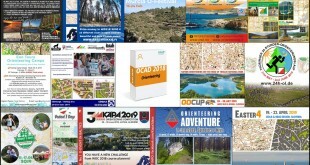 The first three controls were set in tricky terrain were you had to be really careful with your orienteering to find the best microroutechoice and avoid mistakes. 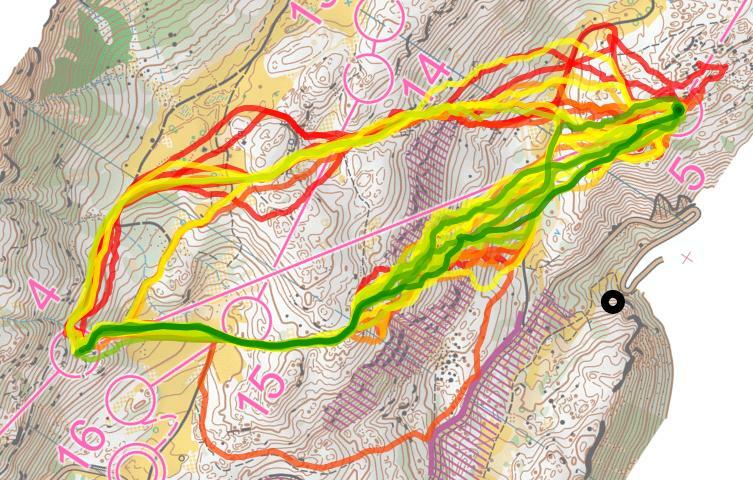 The first part of the women’s course is definitely more difficult than the first part of the men’s course. 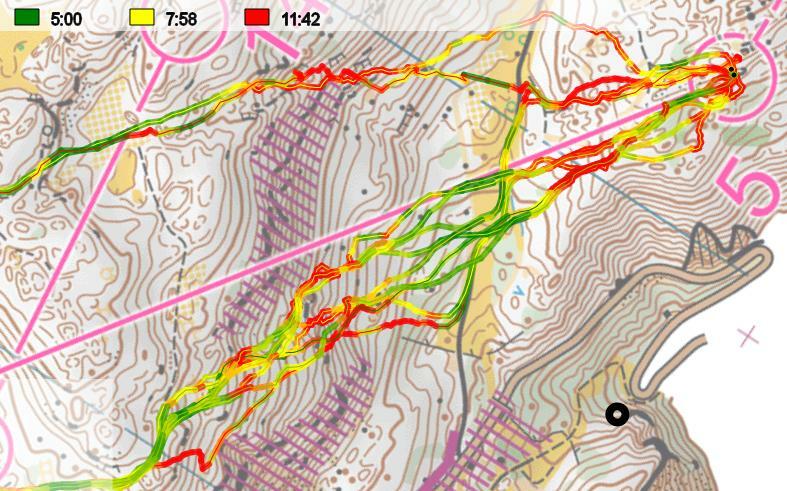 Especially the first control is challenging as you can run fast in the open areas and then have to slow down due to the tricky orienteering inside the forest. 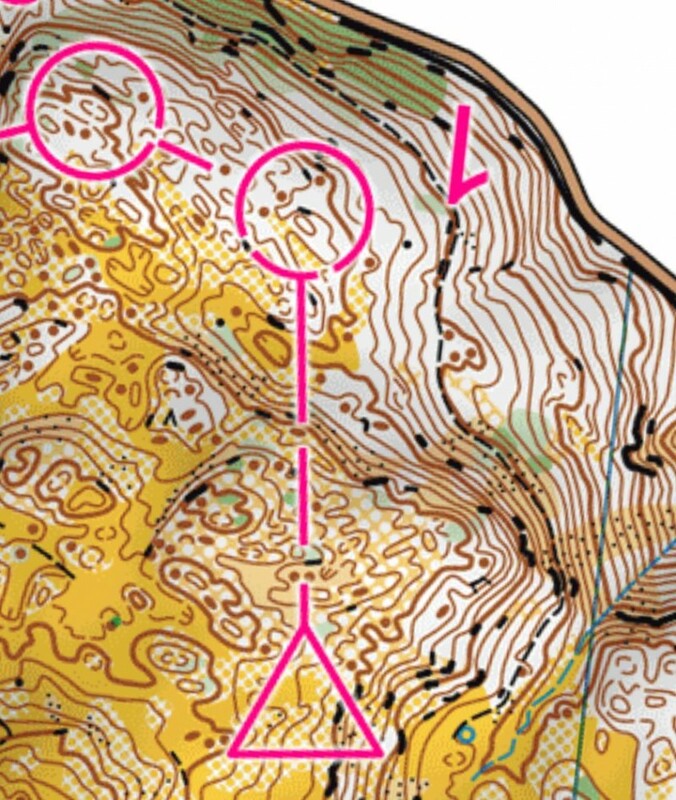 Add to this the steep slope halfway on the leg to the first control which you need to either climb down or avoid by running around to the left. 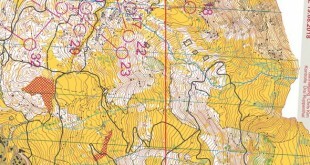 The best route on this leg was to avoid the steep hill by rounding it at the left side, as Tilda Johansson and Valerie Aebischer do. 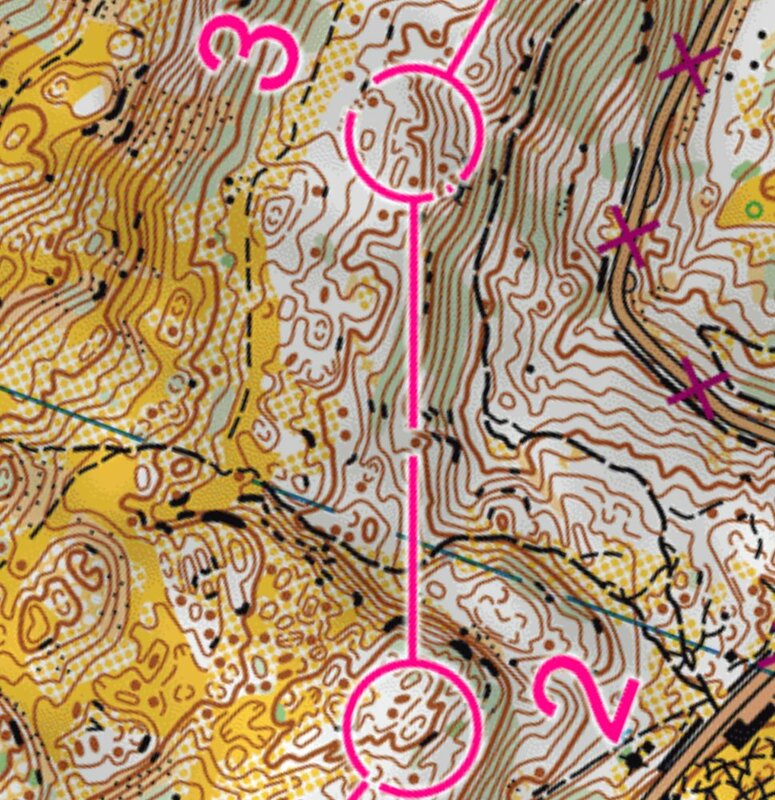 However, it was possible to run well with a straight route choice as well, as Emmi Jokela shows with the third best split time and 19 seconds lost. Many runners lost significant time here by underestimating the difficulties. The eventual winner Anna Haataja had her worst leg here and lost 43 seconds. Four runners finishing in the top 10 (Novotna, Eide, Lundanes and Gross) lost more than one minute already at this short first leg. Paula Gross (finishing 5th) lost 2:52 to the best split time here – that is nearly the time up to a medal. There were also many other runners loosing significant time to the first control, and many different routes being run. 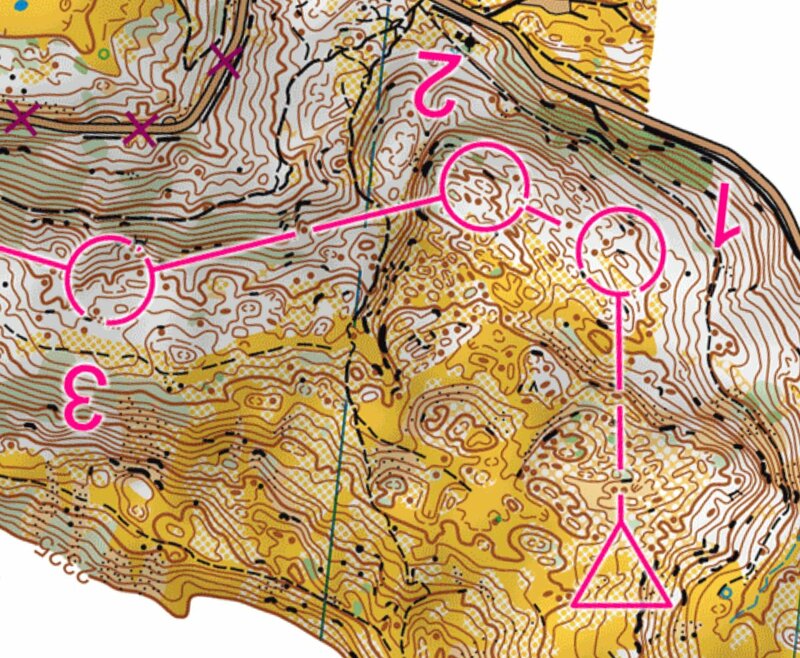 The runners actually covered most of the triangle between the start and control 1/control 2 with their tracks. And these are only the runners with GPS who are expected to be the best third of the start field. 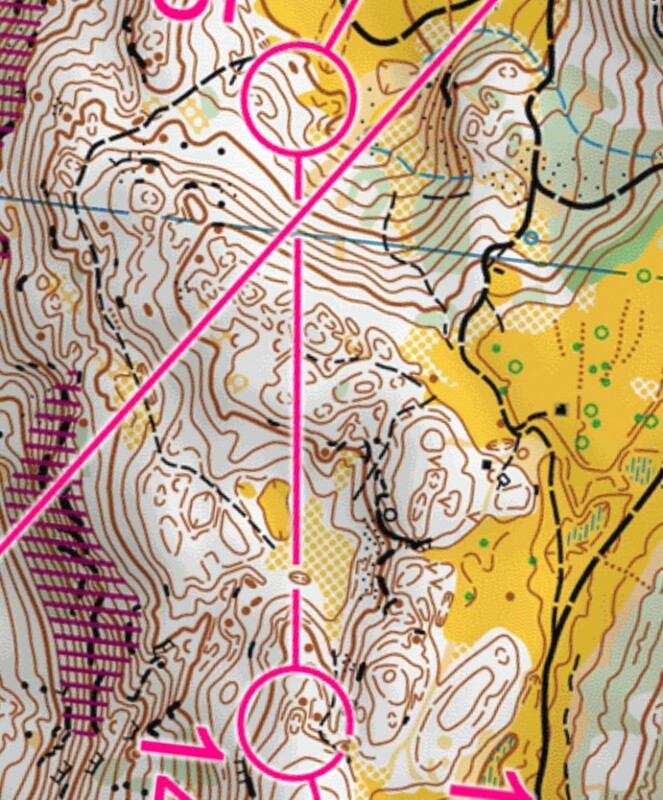 The second control was also in this tricky area where you had to be very careful with your orienteering to avoid mistakes, but now the runners were mostly prepared for it. Except maybe Tilda Johannsson who won the first leg clearly – she lost more than 1:30 here. The winner Haataja (lost 39 seconds) and two other runners finishing in the Top10 lost more than half a minute here on this leg. The leg to the third control was still in the same type of terrain, but now you could choose to go down the slope a bit (although you shouldn’t). Bad planning of the routechoice could loose you some valuable time here. Haataja lost more than 30 seconds again (third leg in a row with big time loss). The below illustration shows the medalists and the ones finishing in Top10 – nearly half of the Top10 finishers loose more than 30 seconds here. Quite a few of the runners who finish further down on the results go to early down in the slope, loosing significant time (up to 4-5 minutes). Note how the winner Haataja is already 1:44(!) behind the current leader Valerie Aebischer in 14th at this point in the course. Six of the runners finishing in Top10 are placed 13th or worse with more than 1:40 lost – Paula Gross who finishes 5th is 3:06 behind. To control 4 the terrain and the technique to be used changes significantly. The course now goes down a steep slope. This is a routechoice leg where tactics is important. The question is if you should run straight down the steep hill to the path and follow that (first flat and then uphill) or if you should continue along the slope before going down the small path. In addition you need to be careful the last part down to the control. 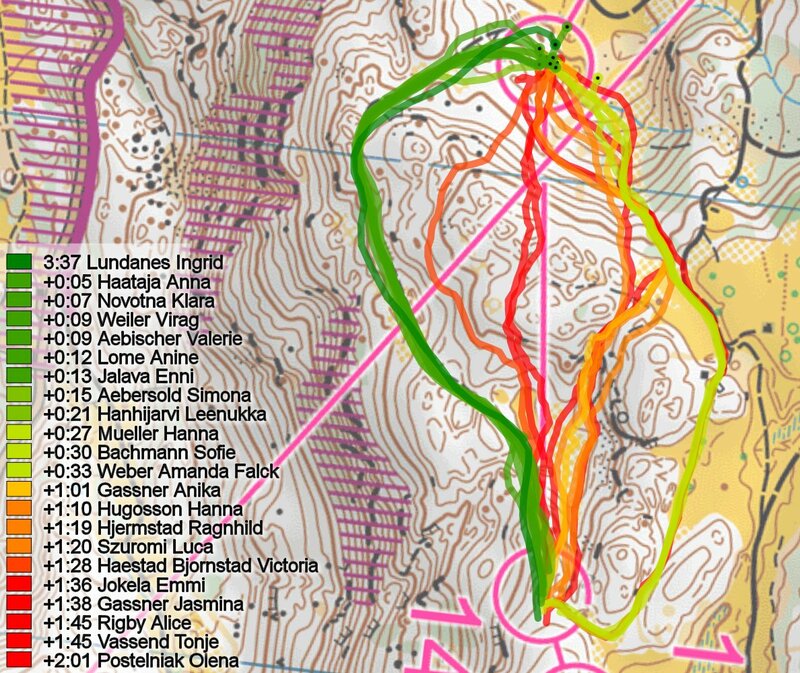 Both routes seem to be fairly similar in time when executed well (Bjørnstad Hæstad is fastest with the upper route, Dvorianskaia is 3rd fastest on the lower route, loosing 11 seconds). Still, 7 of the Top10 finishers loose more than 30 seconds here – three loose more than one minute. Bachmann who takes bronze looses 1:01 here due to searching for the small path down the slope. Next up is the longest leg on the course. Due to the steep cliffs which are marked as forbidden, there are three main variants due be chosen on the first part of the leg – left, middle or right. Going to the right is not a real alternative for the women (as it was for a similar leg for the men), so two alternatives are left. The majority of the runners choose to go straight using the middle passage through the cliffs, and the seven fastest times are ran here. The below illustrations of all routes chosen illustrates this. Note also how many different micro-routechoices are chosen – a good execution of the leg is very important. The fastest runner going left is Sofie Bachmann (bronze medalist), looses 1:16 to the time of Simona Aebersold who has the fastest time straight. The comparison of the two routes below shows that Bachmann looses most of the time in the steep section – as the slope is steeper for the leftmost route than for the more direct route. Her is an overview of the runners finishing in Top10 (+Simona Aebersold who wins the leg). Note how 7 runners loose more than a minute and two runners loose more than two minutes (Lundanes, Jalava and Novotna). 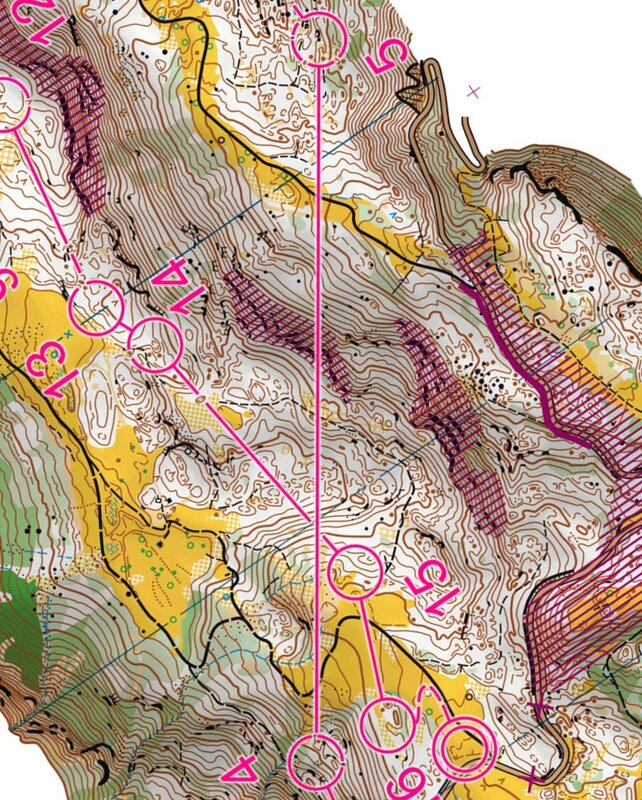 Valerie Aebischer has still a clear lead – Haataja is now up in third at 1:32. 5 over the runners finishing in Top10 are still outside the Top10. 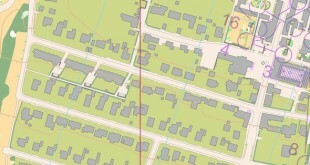 Of the runners finishing in Top10, 40% took the straight route and lost more than 2 minutes (Aebischer, Lome, Hanhijarvi and Lundanes). The fastest on the straight route was leader at the 5th control, Valerie Aebischer, silver medalist. She did loose 2:09 to the best split, more than she was behind Haataja in the finish! 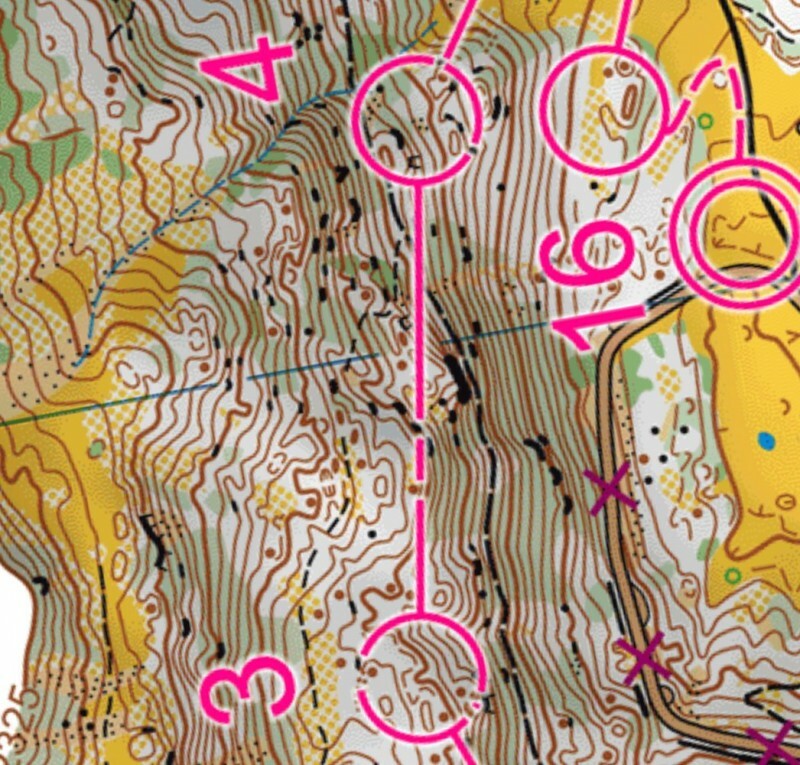 According to course setter Fabian Hertner, it was not planned that there should be so large time differences between the direct route and going around – the main difference was planned to be the more difficult execution and control taking on the direct route. According to Hertner, the big time loss on the direct route even with good execution is due to the vegetation being higher than usually due to all the rain the last months. Note how the sprint gold medalist Aebersold is now in a clear one minute lead ahead of Haataja in 2nd with Aebischer in third at +1:28. 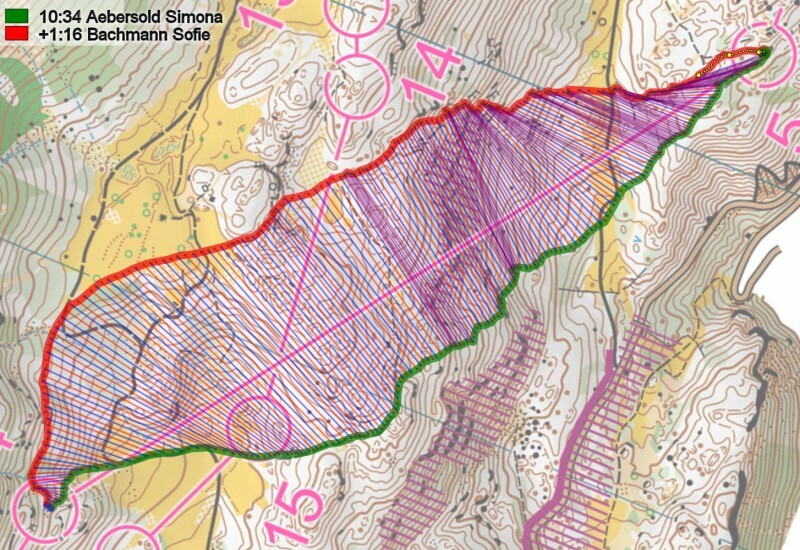 After a short and easy leg to control 7, we come to the crucial leg for Simona Aebersold. Aebersold simply forgets to take the 8th control, coninuing on the road to 9 and not noticing it before nearly arrived at control 9. The result: 8 minutes and 45 seconds lost to the best split time. That is 15 seconds more than she was behind the Gold medal at the end of the race. Taking a look at the standings at control 8, we see that the top 4 runners on the list are unchanged from here and to the finish. 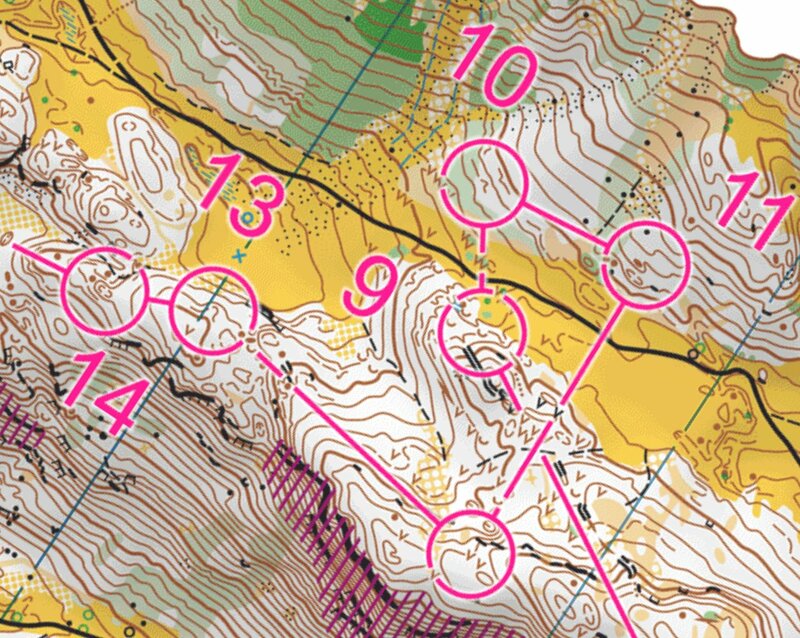 This is partly because we now go into a part of the terrain with easier orienteering which is less physically demanding – we saw the same in the men’s race. Novotna, Johansson and Vassend do however loose significant time in the last part of the race, going out of Top10. Novakova was in 5th before this leg, but the 2:40 time loss on this leg due to running partly over the hill pushed her out of the Top10, finally finishing in 14th place. Due to this mistake Aebischer lost another place on the intermediate results, Bachmann slipping past into 2nd place. Bachmann did however not keep the silver medal position for long – already at the next control she put in a minute mistake, and was back in third position – a position she kept all the way to the finish. Despite Aebischer doing a mistake down to 14, loosing another 45 seconds to the fastest split time. Quite a few runners lost 2 minutes or more on this seemingly easy control. The second last leg was a nice routechoice leg with three separate options. Here it is clearly faster to go left. Going right is too long and going straight gives too much climb and too much slow terrain. 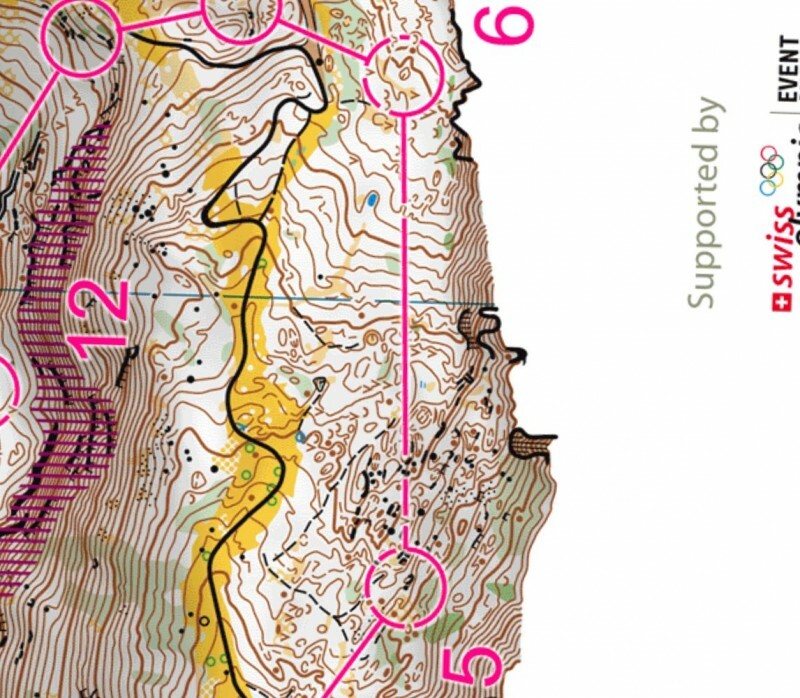 This did not influence the very top of the results, but Tonje Vassend went out of the Top10 – positioned in 8th at control 14 and finishing in 11th position in the finish after loosing 1:45 on this leg. Thanks a lot for noticing & telling me, fixing now!